It’s baaaaaaa-aaaaaaack. That’s right! We’re watching some more of our favorite horror franchise: Friday the 13th. Last cycle we had to endure the fifth in the series, which was so bad that it almost destroyed my taste for all things Jason Vorhees… almost. 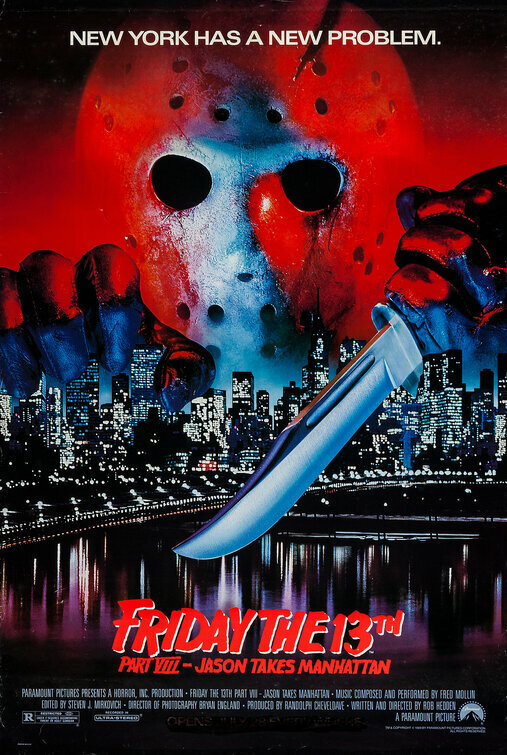 For the StreetCreditReport.com cycle we have to jump to the eighth film in the franchise, Friday the 13th Part VIII: Jason Takes Manhattan, which often makes it to the top of the worst of the series lists. This is reflected in the RT score with a solid 2/22 (8%). This of course means that we have non-BMT homework for Part VI: Jason Lives (which is often considered one of the best in the series; 52% RT) and a BMT qualifying bonus film Part VII: The New Blood (30% RT) which we just previewed. We’re going to do it guys. We’re going to watch the entire series in a single year! Let’s go! Leonard Maltin – 2 stars – The best film in the “Friday” series, imaginatively directed and written by Hedden, is still just a slasher film, though less gruesome than most. Despite the title, most of the film takes place on a cruise ship. Too long and not really for fans of the series. Rotten Tomatoes – 8% (2/24): No consensus yet.